The chalet style cabins at the Somerset Beachside Cabin & Caravan Park are all pine lined and have aged to a golden yellow which makes the pine feel warm and homely. All cabins have kitchen facilities and include a small stove, microwave, fridge and utensils. The cabins are basically designed in two halves, one side has a double bed and the en-suite area, the other has a kitchenette, a lounge area and a set of bunks. In several cabins the couch folds out to a double bed as well, allowing those cabins two double beds and a set of bunks. 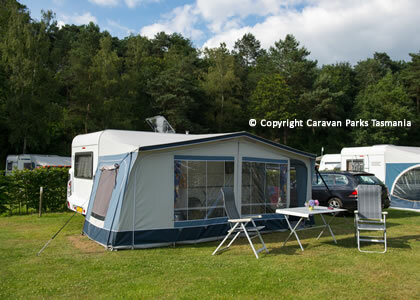 The Somerset Caravan Park has been laid out with the camper in mind. All powered sites are within about 40 metres of the amenities block and all have direct access to clean water. Many sites are also surrounded by low trees which can act as a wind break. There are 42 powered sites available on the park, and most sites can handle any length van or motorhome, campervan, camper trailer or caravan with ease. The unpowered sites are located on app. 2 acres of well kept grassland which is protected by a range of native and pine trees. The unpowered sites are within app. 50 metres away from the amenities block. Campers have the opportunity to camp wherever they like within this area to ensure maximum privacy. 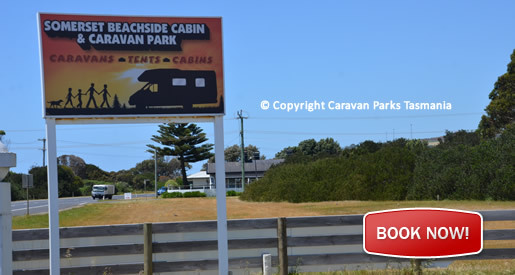 The Somerset Beachside Cabin Caravan Park is located on the Bass Highway and is establishing a well earned reputation as being a great site to base for a range of day trips to places including Stanley, Smithton and the far west coast, Cradle Mountain, Waratah and Leven Canyon – all these sites being within about 1 -11/2 hours drive.